Scusate la mia imperdonabile assenza negli ultimi giorni ma sono stato davvero molto impegnato. Presto vi dirò anche il motivo! Ecco l’outfit che ho scelto per l’inaugurazione del nuovo store “Hackett” in via Manzoni a Milano. Sia il negozio che i capi meritano davvero e, nel complesso, è stata una serata molto piacevole. Nei prossimi gioni pubblicherò un post dell’evento. Da circa una settimana il tempo è pessimo, giovedì invece è stato l’unico giorno realmente primaverile e soleggiato: come non puntare su un look finalmente fresco e basato sui toni dell’azzurro? Vi piace il mio nuovo taglio di capelli? Poi ci dirai cosa c’era nel sacchetto della Church’s dell’ultimo post…ci hai lasciato per 4 giorni con questo dubbio!!! Bellissimo look! Stupenda la Giacca! Complimenti. Bellissimo look! La Giacca è stupenda!! Adoro! 🙂 Quale parrucchiere frequenti/consigli per un taglio uomo? Blue is amazing for you, also love the touch of burgundy! Whole outfit is stunning as always! take these loafers off ! You’re right, it lacks a belt and secondarily a tie or a bow tie. However, for his Tassel Loafers, I disagree with you. In addition, as I’ve already written, it’s only in France where this type of shoes has a negative image and even corny. Elsewhere it’s absolutely not the case, in addition, often the hippest guys wear Tassel Loafers. However, about his Tassel Loafers’ brand : Church’s, as I wrote, I had some reservations because of it “bookbindé” models. For those who don’t know what’s the définition of “bookbindé”, it’s a leather whose surface (grain leather) has been “shredded” to be covered with plastic! It’s a technique widely used in Italy for sofas in true/false leather. In my opinion, it’s a sacrilege to cover leather grain with plastic, a material that’s aging badly. Besides, I don’t hesitate to say, like many lovers of beautiful shoes, that it’s a shame for a brand like Church’s to sell several hundreds of euros “plastic shoes” as we can found it (in only a few euros) at the supermarket. E’ un’impresa quasi impossibile abbinare tanti blu diversi, non trovi? Ciao, il taglio è molto bello ti rende più…maturo ed elegante. Per quanto riguarda l’outfit, semplice ma impeccabile. una curiosità: perché nella foto dove sei disteso sul divanetto (elegante anche quello!!) ti sei tagliato le estremità dei piedi? la foto non risulta correttamente centrata, che mi dici? So preppy!! I love it!! You’re right Filippo, your absence is inexcusable! Yes inexcusable, because we were apprehensive. You mustn’t make us such frights! Of course, I joke because I doubt that you’ve major projects underway … D & G, Dsquared, LV …? Mystery! That is said, back to basics : your outfit for this wonderful opening party of the new “Hackett” flagship store in Milan :-). Here, the main element of your outfit is undoubtedly the double breast jacket otherwise called “blazer” name of the boat on which appeared this type of jacket in 1867… But don’t worry, dear Filippo’s followers, I’m not going to tell you the story of this jacket. Legendary garment, it’s not possible to take too much originality with it. If purists, considere that wearing a blazer is reserved by the seaside, it’s still acceptable to wear it outside of the shoreline. But beware, you must follow certain rules! 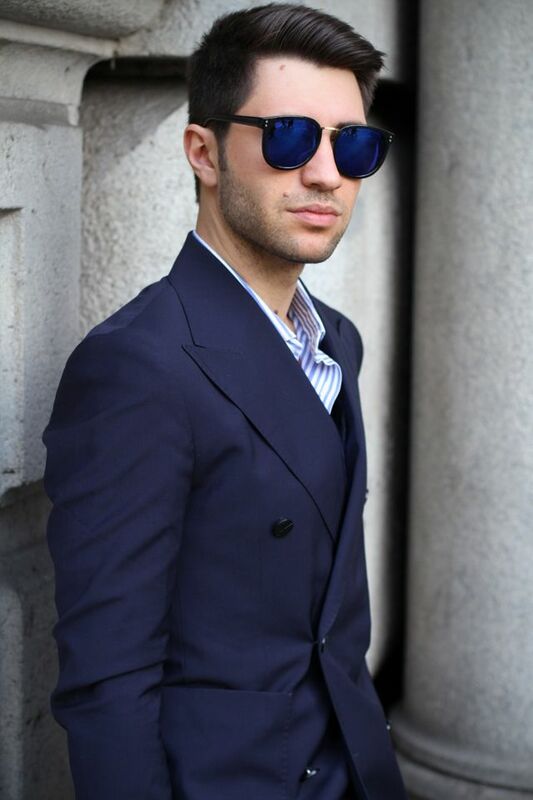 1 – The color: A blazer must absolutely be navy blue. 2 – The buttons: they should never be golden, you’re not a marine. 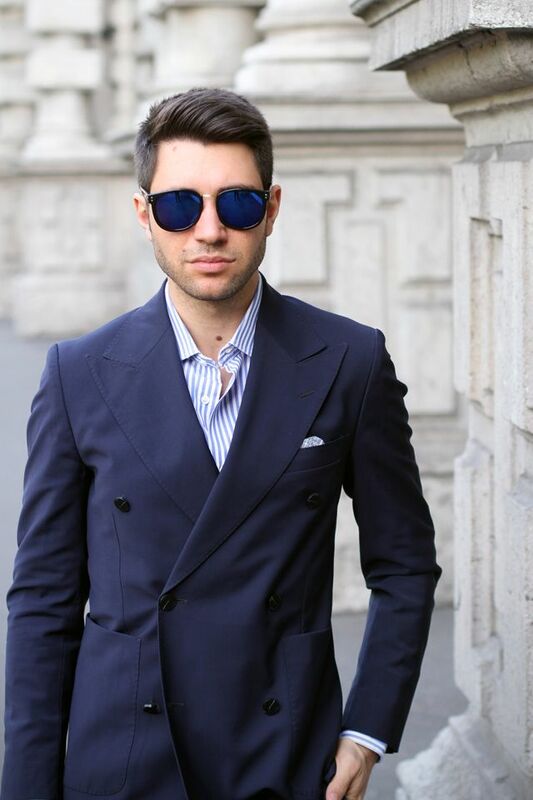 In this case, you can choose between three colors: dark blue, beige (in horn) or dark like Filippo’s blazer. 3 – The trousers: generally it should be either beige, like the Americans, or gray, like the Europeans. In the case of Filippo, his trousers’ color is the only downside that I bring to his outfit : it’s not very conventional. But, after all, this is what makes his style. 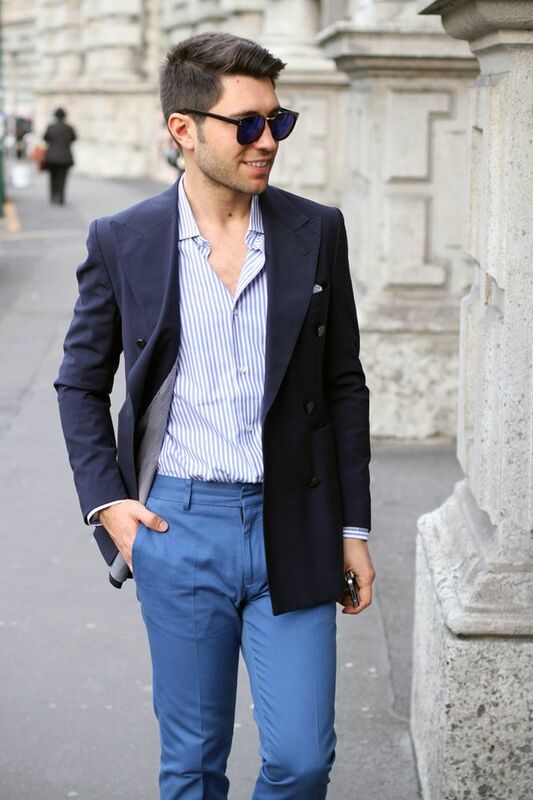 Anyway, in choosing the colors of their trousers, Italians often show originality, and it doesn’t displease me. 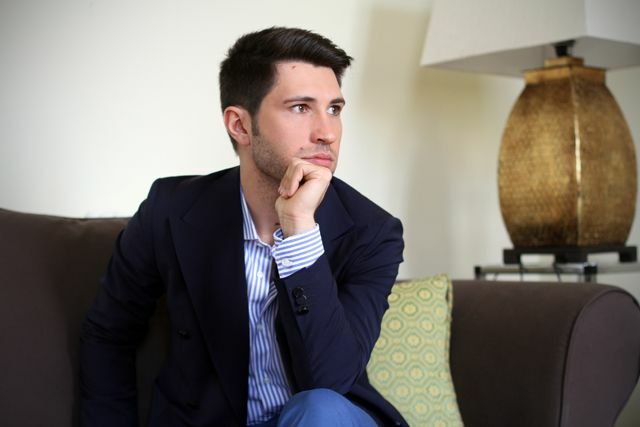 Moreover, for the anecdote, when I was younger (don’t laugh, I’m still young because I’m under 35), I remember that all summer, in Brescia, my uncle always wore his blazer with a red pants… An italian tradition that I finally adopted and I like it. 4 – The shoes: Unlike buttons, black is banned!! With a blazer you should always wear brown shoes. 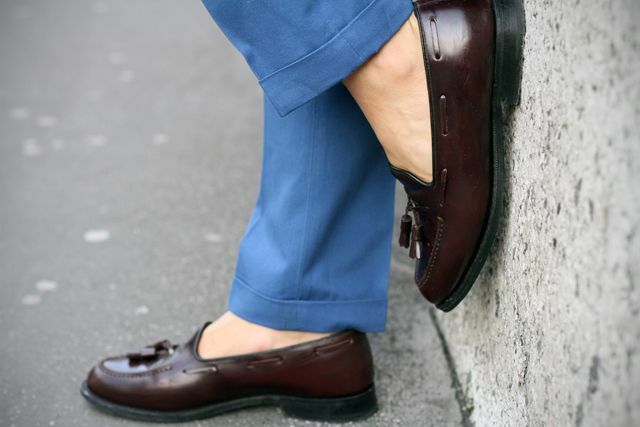 In the case of Filippo, his Tassel Loafers are a perfect choice. Your vision of fashion is very sad ! The blazers can be in tweed, pink or even green ! 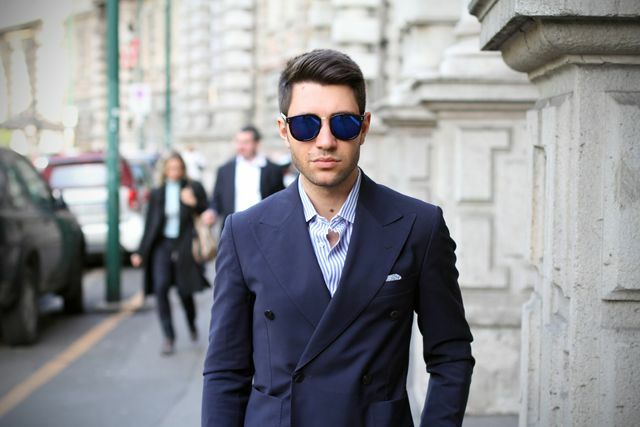 Look at some blogs like jakandjil or thesartorialist ! Fashion need to break rules. Look at, for exemple, Francsco Cominelli, he was wearing a blazer in tweed, with a green chinos. You’re too conventional. I think you write here for spread your knowledge, but you’re boring ! Julien answer : If for you wearing a blazer with a red pants, like I do and like I wrote on my comment (at the end of item number 3), it’s having a very sad vision of fashion, I’m curious to know what, for you, is not sad! 2- Anonymous said : “You’re too conventional”. Anonymous said : “I think you write here for spread your knowledge, but you’re boring ! Julien answer : Yes I’ve some knowledge and so what? What bothers you? For my part, I prefer to share my knowledge and my views about fashion with others, rather than content myself with the usual “oh fabulous” “I love it’s super”… Comments certainly more boring than mine. What I expect, it’s not to be insult, like you do, but exchange my ideas and confront my vision of fashion with others … It could be rewarding. It’s unfortunate that you’ve added insult to your comment, because you’ve an interesting opinion, especially when you evoke the tweed double breast jacket. Maybe I should have specified on my comment but, for me, I make a difference between a classic blazer and a double breast jacket. It’s perhaps because in France the term “blazer” refers to a very specific type of jacket that I mentioned in my comment. Having said that, it doesn’t bother me to see a man wearing a tweed double breast jacket with a green pants (and even with a green corduroy pants), instead, it’s very smart. To conclude, let me pleasure, next time, before you insult me think about this: “insult is the weapon of the poor spirits” 🙂 This advice is not directed only at you. I stopped in the third line … I never liked to discuss with people like you. Thank you ! You’re confirming what I thought : you don’t participate in this blog to exchange ideas and debate, but only to criticize and insult the others, without even taking the time to read their comments. Your attitude speaks volumes about who you are and it doesn’t grow you up. bellissimo doppiopetto!! Dove trovi Royal Hem a Milano? I always appreciate your looks. However, I think you should try to surprise us more often. Your mixes are too often predictable. Why not try something new, less “classic”? Finally! An intelligent anonymous who understood exactly what I expected as reactions to my comments. Unfortunately, I’m a little busy, so I won’t answer immediatly and in detail to your comment. If you can wait a bit, I’ll answer you with pleasure in the afternoon. In fact, I didn’t speak specifically about Filippo’s shoes but only on some Church’s shoes made with bookbinder leather. – Church’s model : Tassel Loafers – Keats. – Price : around 500 euros. – Color : burgundy, it’s a sort of reddish brown (burgundy words refers to burgundy wine which in turn is named after the Burgundy region of France). – Leather : polished binder (Binder = Bookbinder). Of course, I could be wrong (but I don’t think), because all Church’s shoes are not made with bookbinder leather, only few models. In fact, everything depends on the purchase period of Filippo’s shoes. Because, few years ago, Church’s didn’t manufacture shoes with Bookbinder leather. Finally, to be sure what type of leather is used, it’s better to see the real shoes and not a picture. Otherwise, about what I wrote about Church’s shoes made with bookbinder leather, for clarity I didn’t say that Church’s shoes are poor quality. Of course, I’m perfectly aware that Church’s’ shoes’ quality is no comparable with supermarket’s shoes’ quality. It’s just a little provocation. Obviously I will not explain here why I write this, it’ll be too long, but I can say : despite Church’s shoes quality (which remains well above of supermarket’s shoes) if I must choose (at the same price and the same quality manufacturing) between a Church’s’ shoes made with bookbinder leather and an other brand’s shoes made with natural leather I would rather buy shoes with natural leather. You’re so boring that Filippo decided to remove your comment ! Ahaha too bad ! You’re confirming what I thought : you’re ILLITERATE!!!!!!!! Yes, ILLITERATE!!!!!!!!! In this case, THE AUTHOR it’s ME not Filippo! In fact, Filippo is THE BLOG ADMINISTRATOR. DO YOUR UNDERSTAND? Or it’s too complicated for you? So, Filippo has NOT deleted my comment, it’s ME because it had been published twice. Next time, before you laugh at the others, THINK a little… If you can. It’ll save you from being ridiculous. I’m a big fan of your shoes! Lovely pictures. Tutto ottimo, avrei magari aggiunto anche cintura e calze, però questo sfumature di blu è di un’eleganza notevole, bravo!